The Second Dureji Expedition is scheduled for the 27th – 29th of January 2007. It will be a 2 night / 3 day trip with departure at 8 a.m. on Saturday, the 27th of January 2007, travelling staight to the base of Andahar Mountain (height – 4,000 ft) and setting up camp there for both nights. The second day we’ll 4wheel up the mountain, have lunch there, then return back to camp for the night. Return scheduled for the Monday, Jan 29th. There are 15-20 ex-army M38-A1’s available at Ghani Mill Godown in Karachi. They are original Army color, fresh from Auction with NO RUST. Buy an engine with gear box complete from Shershah and first get it mechanically functioning, and get the wiring etc done then re-paint outer shell to your choice color. “Dureji Expedition” is a 4×4 Jeep Eco Rally being organized by the Outdoor Adventures & 4×4 Club of Pakistan. This is an environmentally conscious rally which aims to provide owners of 4×4’s to experience the beautifully rugged yet pristine areas of Baluchistan very close to Karachi. < Google Earth, download the download this file or click here to see it on Google Maps. The object of the “Dureji Expedition” is to drive through various within the jurisdiction of Dureji Tehsil. The route consists mainly of Shingle tracks which are primarily used by camels and infrequently by vehicles, thereby providing ample opportunity for drivers to test their skill. The Expedition also aims at traveling in a group to ensure that problems faced by any particular member with respect to vehicle breakdown, etc., can be jointly dealt with and resolved, removing the fear of being stuck in some remote valley with no help. Rest assured, we will all be there. The Expedition is scheduled to depart from Karachi on the 17th of November, 2006 from Defence Phase V and shall consist of 3 traveling days and 2 night stays. All participants will have to bring their own food and water and other necessities, whereas excellent camping ground with electricity and toilets and kitchen, etc., will be available at the camp site. The area we shall be driving through is located just North – North East of the Hub Dam which is visible on Google Earth next to Karachi. We already have over fifteen 4×4 Jeep owners enlisted for the Expedition including a few families. If you are interested in joining this expedition, please let us know through the contact form along with names and number of people intending to travel with you and the kind of vehicle you shall be driving. At the milestone “Aghore 42 Kms” on the Coastal Highway driving towards Ormara/Pasni a small sign post on the left indicates the track for “Sapat Check Post” of the Coast Guards. 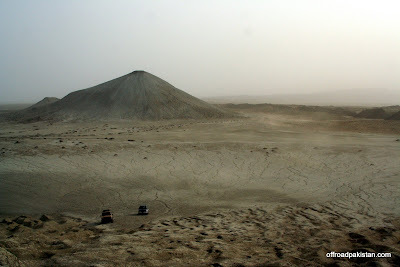 Visible from the highway on a clear day, one can see the tallest mud volcano in the world. ‘Chandragup’ standing at nearly 500 feet in height, the magnitude of its immense size gets noticeable as one gets closer. The second volcano ‘Ramagup’ also becomes visible, at nearly 250 feet with a massive crater in the center filled with greenish-brown water bubbling every once in a while. Wednesday March 9 6pm at the Goethe Institue. Results of the recent work of the German-Pakistan archaeological mission to Kalat.